Kerala is the Southern State of India. It has an area of 15.005 square miles (38.863 square kilometers), only about 1 percent of the total area of the country. The state stretches for 360 miles (580 kilometers) along the Malabar Coast on the southwestern side of the Indian peninsula, its width varies from 20 to 75 miles. It is bordered by the states of Karnataka (formerly Mysore) to the north and Tamil Nadu to the east and by the Arabian Sea. 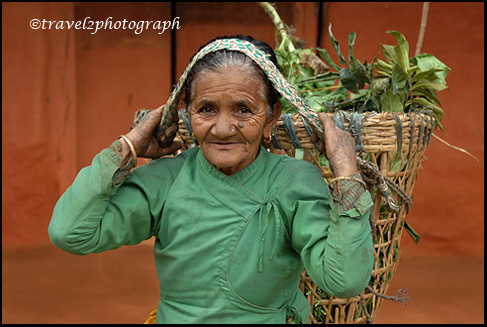 Kerala, certainly is a rich cultural and ethnic place due to its diversity. 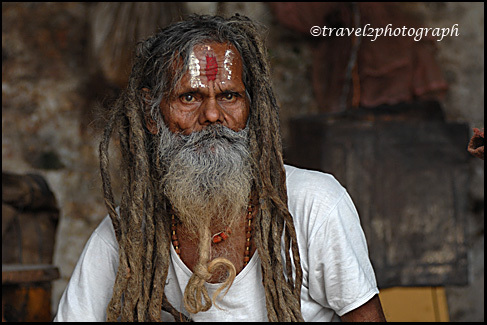 The visit to religious places of Kerala is the best option to view the different architectures of ancient India. The Kerala backwaters are a chain of brackish lagoons and lakes lying parallel to the Arabian Sea coast (known as the Malabar Coast) in the Kerala state in Southern India. The network includes five large lakes, linked by 1.500 km of canals, both manmade and natural fed by 38 rivers, and extending virtually the entire length of Kerala state. The backwaters were formed by the action of waves and shore currents creating low barrier islands across the mouths of the many rivers flowing down from the Western Ghats range. Vembanad lake is the largest of the lakes, covering an area of 200 sq km, and bordered by Alleppey, Kottayam, and Ernakulam districts. The port of Cochin is located at the lake’s outlet to the Arabian Sea. 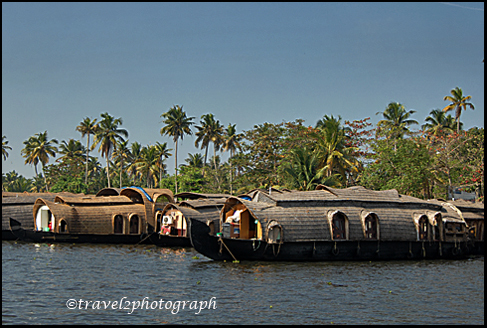 Alleppey, or “Venice of the East” has a large network of canals that meander through the town. 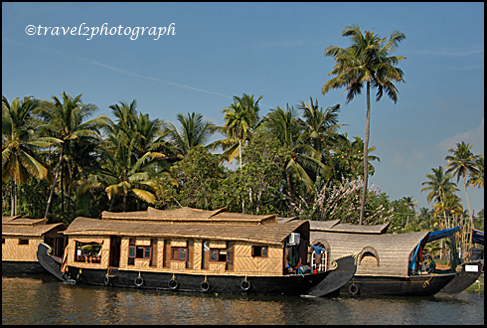 A houseboat (Kettuvallam) is a kind of moving floating house in Kerala, India. 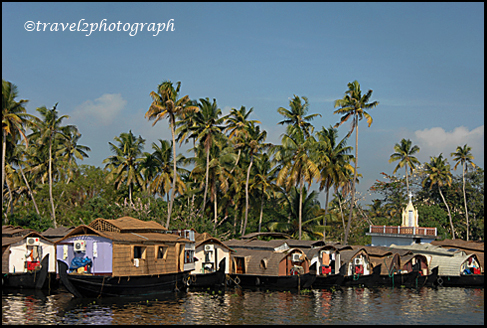 Kettuvallam literally means “bundle” or “package” boat (‘Kettu’ means tied with ropes, and ‘Vallam’ means boat – Malayalam language). A houseboat is about 60 to 70 feet in length and has a width of around 15 feet in the middle. The boat is made of wooden planks joined and stitched together using coconut fiber ropes. Usually the wood used will be ‘Anjili’, The roof covering is made of bamboo poles and palm leaves. The outside of the boat is painted using cashew nut oil, which acts as a protective coating. 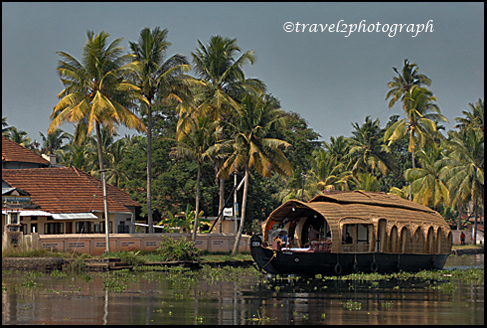 During the time when road and rail transportation was expensive or unavailable, traders used Kettuvallams as a form of main transportation in the inland waterways. The boats had enough facilities for cooking and sleeping for the boatmen. Sometimes boatmen’s families also accompanied them. 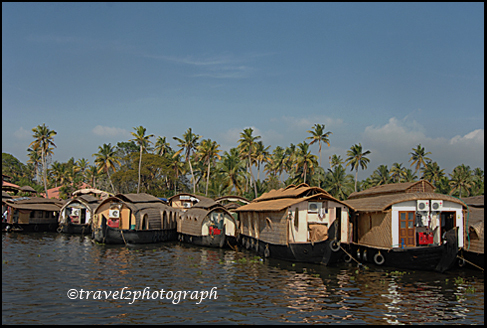 The new generation houseboats are renovated forms of original Kettuvallams. 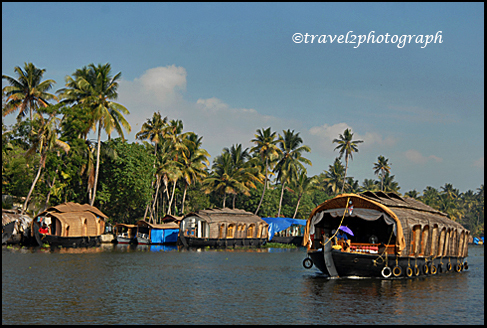 The modern type of houseboats have all the creative comforts like in a hotel i.e. well-furnished bedrooms, modern hygienic toilets, cozy living rooms, dining area, beautiful kitchen and in some cases even a balcony for angling. Most of the houseboats are powered by remarkably unobtrusive inboard diesel engines and use solar energy for power requirements. 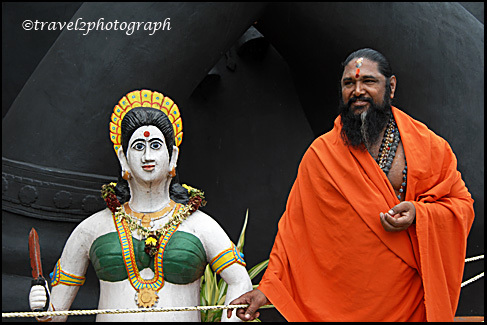 What images and perceptions do suddenly flash in one’s mind when the word Kerala is uttered? A land with beautiful swinging layers of greenery, Blue Mountains criss-crossed by green rivers, never endless streams of backwaters with coconut palms sway on sides…… What more? 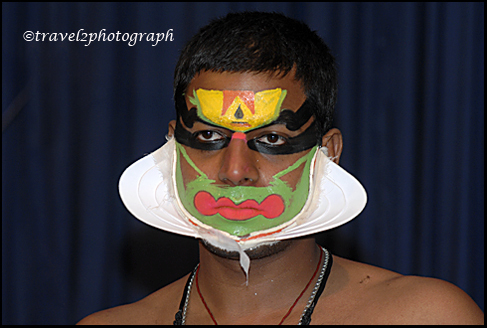 Of course no one can ever miss the exquisite designed Kathakali face mask. 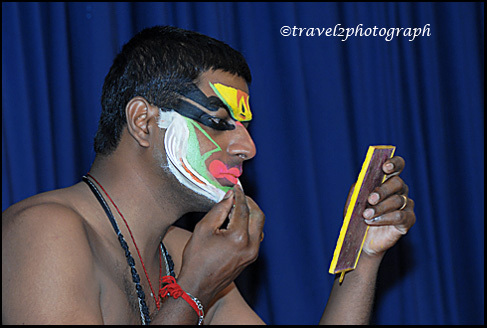 This is because of the fame of this Kerala’s own traditional classical form has crossed the borders of the nation and seven seas to enthrall all its viewers, barring caste, creed, gender, religion or nationality. 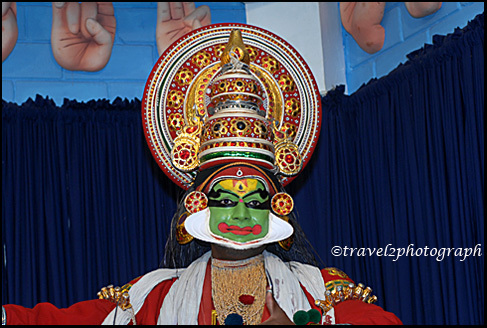 Kathakali evolved in the 8th century from ‘Ramanattam’ a dance drama created by Kottarakkara Thampuran, a great admirer and promoter of traditional art forms. 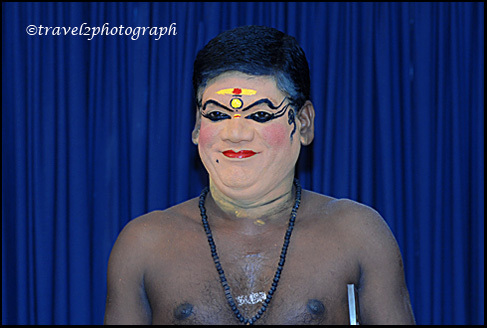 It is Kerala’s very own, much celebrated dance drama. 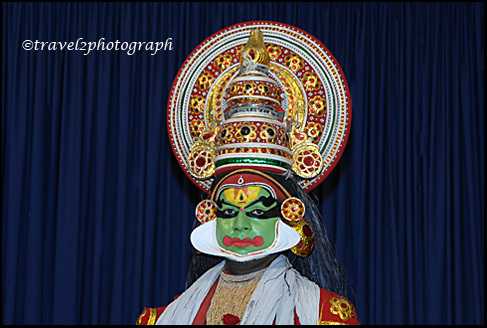 Kathakali draws its theme from the wealth of Indian mythology and folklore. 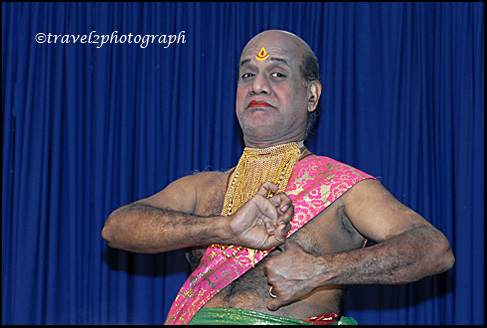 The performer is assisted by vocal and percussion accompaniments while the dancer through ‘hasta mudras’ or hand gestures expounds the theme. Expressions of face and eyes hold the key to perfection. 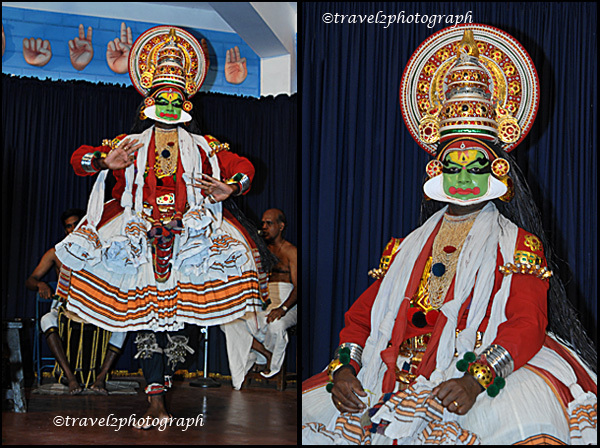 Unique among the Indian dance forms, Kathakali ranks high among the Indian dance forms. 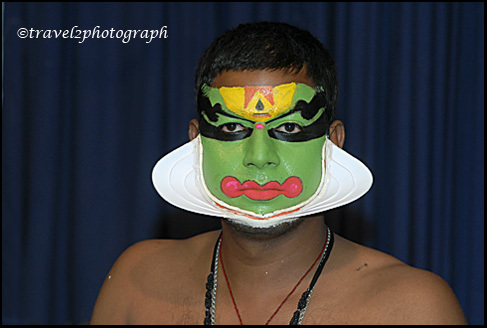 Noted for its archaic costumes, weird make up, the elaborately painted faces often mistaken for masks and grand headgears, Kathakali is perhaps the only dance form in India in which the masculine aspect of the dance is preserved in its elemental vigor. After our yesterday’s trip to the Chennakeshava temple of Belur, I’m taking you today on an expedition to the Hoysaleshwara temple in Halebid. Halebid literally means ‘the ruined city’. 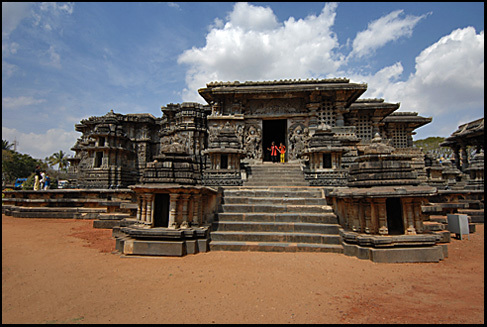 During the 12th and 13th centuries AD, it flourished as the capital of the Hoysala Dynasty for about 150 years. It was also then known as Dwarasamudra (gateway to the seas). However, invaders who robbed it of its treasures, leaving behind the ruins of the once-magnificent Shiva temple, twice attacked it. 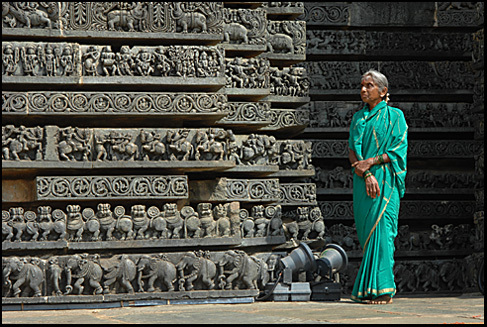 The Hoysalas then shifted their capital to Belur, leaving behind Halebid, a city once grand and since reduced to poverty and ruins. 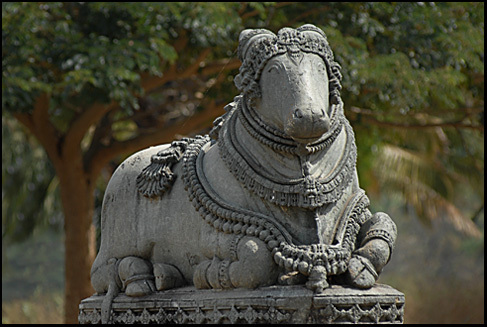 The Shiva Temple, Hoysaleshwara, is unique for its two shrines in the Linga form and gigantic figures of Nandi. 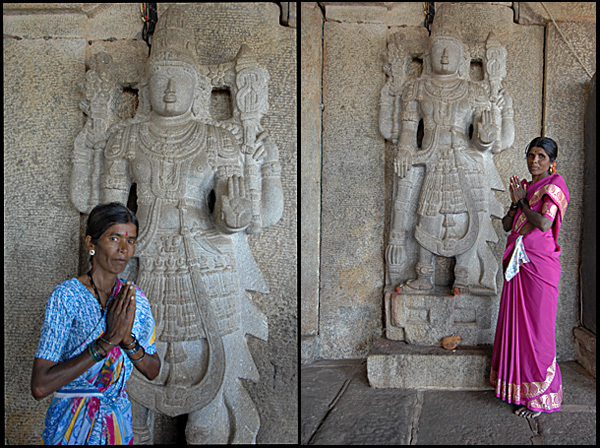 It is actually two temples attached along the north-south axis by pillared walls. 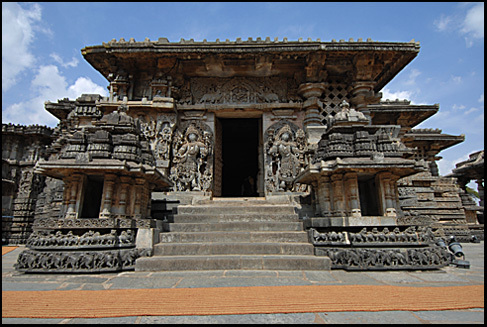 This temple is twice the size of Belur’s Chennakeshava Temple and the figures are larger as well. 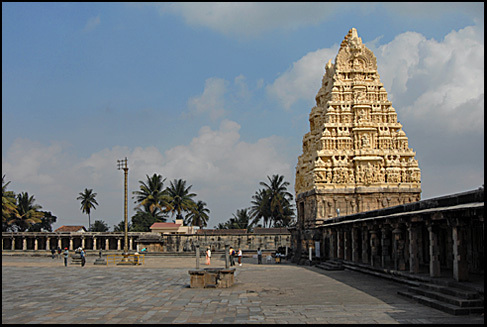 The twin Shiva Temple with a common platform and two garbhagrihas, one beside the other have a common broad navaranga. The temple doorways are highly ornate and impressive. 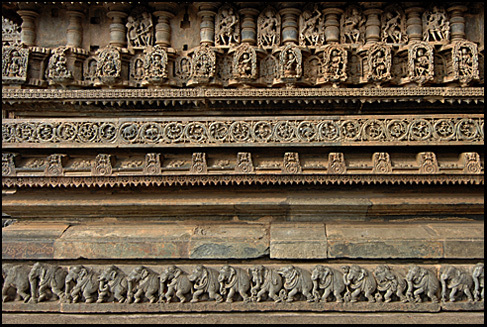 Outer walls have rows of intricate figures narrating episodes from epics like Ramayana, Bharatha and Bhagavata. 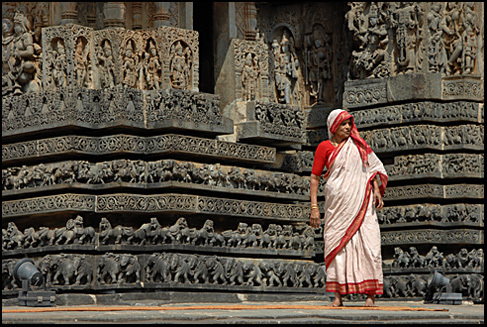 Belur and Halebid are two tiny, but beautiful temple towns 16 km apart in the southern state of Karnataka. 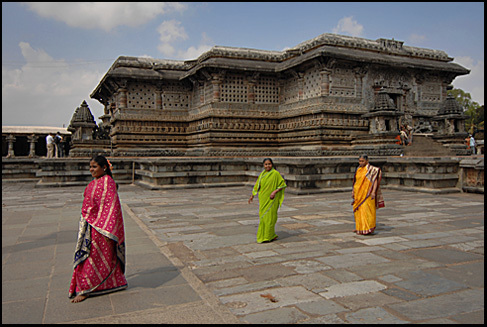 Once at the centre of a great empire ruled by Hoysalas in the 12th century, Belur and Halebid are heritage towns and are home to several exquisite temples which reveal the artistry of Indian sculptors and the mastery of the temple builders of yore. 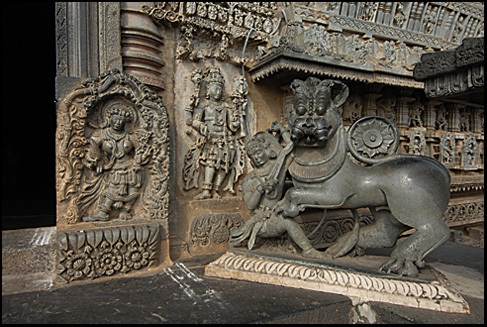 The temples of Belur & Halebid are magnificently done up with intricate carvings and fine architecture. 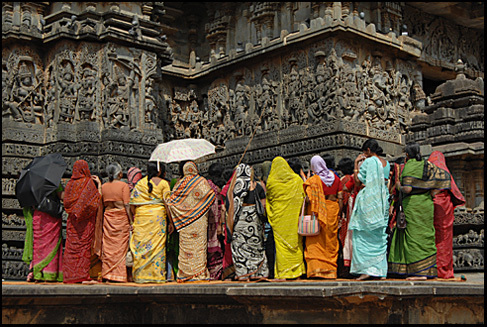 Today I want to take you on a trip to the Chennakeshava temple of Belur. The sage Ramanuja converted Bittiga, the fourth and mightiest monarch of the Hoysala dynasty, from the Jain faith to the Vaishnava faith. 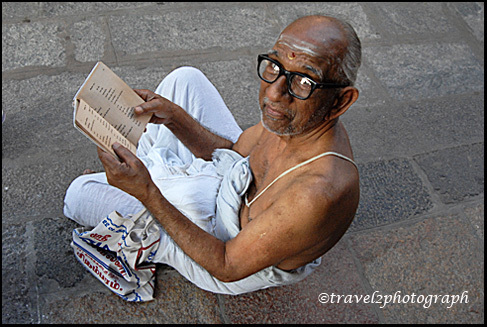 The king changed his name to Vishnuvardhana and built temples with great vigor and dedication. 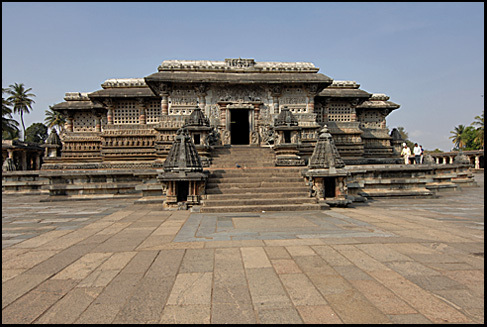 In order to commemorate his victory over the Cholas in the battle of Talkad, he built Belur Temple in 1117 A.D. It took 103 years to complete. 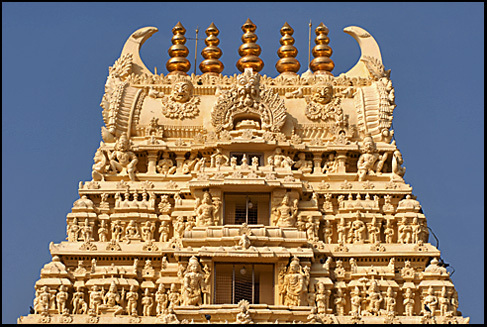 The facade of the temple is filled with intricate sculptures and friezes-with no portion left blank. 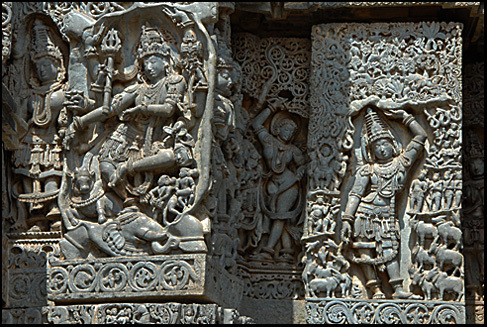 Elephants, episodes from the epics, sensuous dancers nothing was left without being carved. The main temple, surrounded by a group of subsidiary shrines, stands in the center of a rectangular, paved courtyard along the perimeter of which are ranges of cells fronted by a pillared veranda. The temple has lost its super structure but looks very imposing. 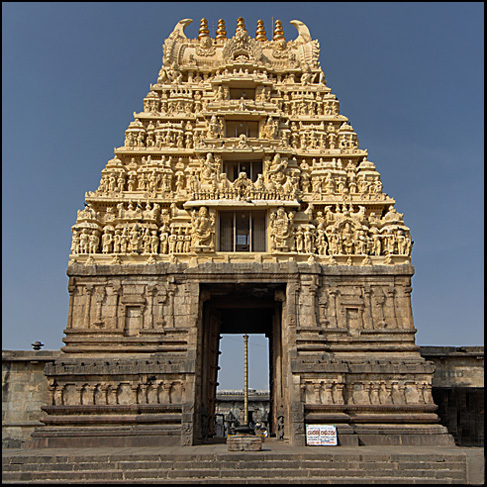 It has a pillared hypostyle hall, a square vestibule, and a solid, stellate vimana. Three entrances lead into the hall, each being flanked by a shrine. The gorgeously decorated doorkeepers guard the doorways on either side. Forty-six pillars support the extensive hall, each of a different design. Historians find a tradition that the ancient and medieval Indian artists rarely sign their work of art. 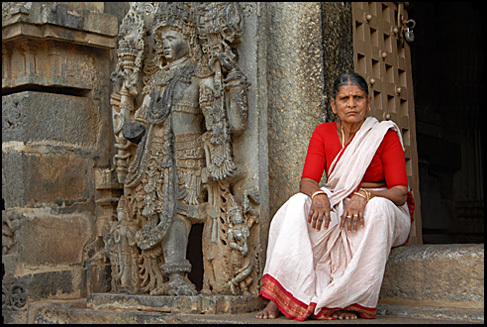 However, the Hoysala sculptors have broken this custom and signed their sculptures. They engraved their names, titles and even the place of their origin at the foot of their art work. 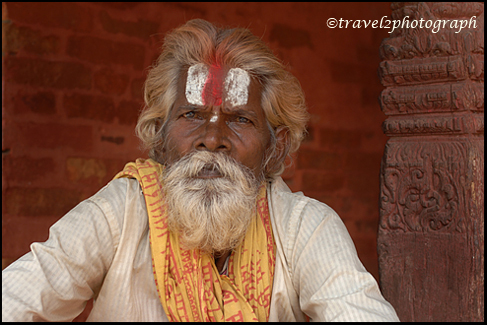 The stone inscriptions and copper plates of the period give some more details about these artisans. 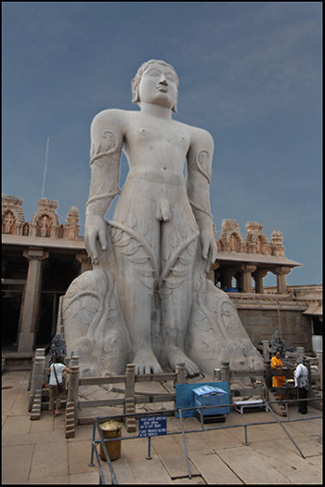 Sravanbelagola (Gomateshwara Temple) is one of the most popular Jain pilgrimage center in South India, an is known for its collossal monolithic statue of Gomateswara, on top of a hill. 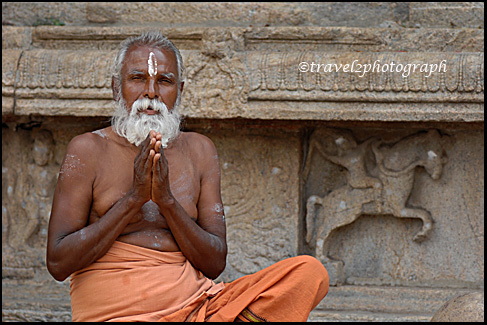 The word “Sravanbelagola” means the Monk of the White Pond (Sravana means Monk and belagola means a White Pond). Chanragiri and Indragiri are two peaks of the mighty Vindhyagiri mountain-range. 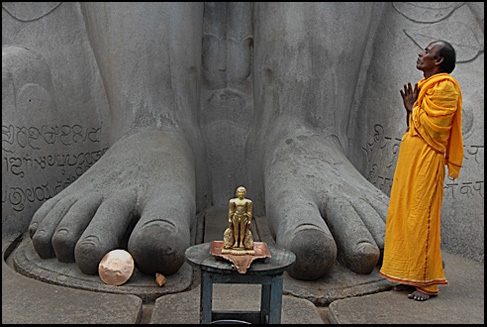 Of this two, Indragiri is famous for containing the 57 feet high statue of Gomateshwara-believed to be the world’s tallest monolithic statue. The history of Sravanabelagola goes back to a long time, when Emporer Chandragupta Maurya arrived here with his guru, Bhagwan Bhadrabahu Swami and embraced Jainism after renouncing his kingdom of Magadha in the 3rd centuary AD patroned Jainism and were responsible for its extensive spread in the south. 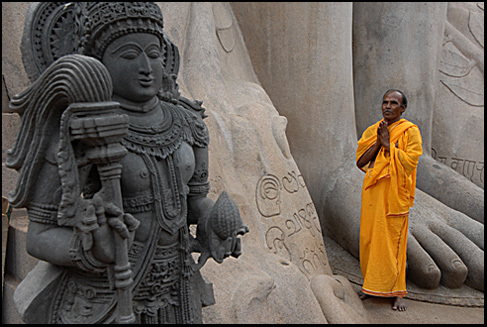 The statue of Gomateshwara was erected during the reign of the Ganga King, Rachamalla, under the patronage of his minister Chamundrayar and by sculptor Aristenemi (981 AD). The temple to Gomateswara is built on top of a hill, in between two hills – at a height of 3000 feet above sea level.The statue, atop the hill, is reached by 614 rock-cut steps. There are many smaller images of Jain tirthankaras (revered Jain teachers) around the image. Jainism rests on a real understanding of the working of karma, its effects on the living soul and the conditions for extinguishing action and the soul’s release. Jainism considers the soul as a living substance that combines with various kinds of non-living matters. The Jain religion rests on complete inactivity and absolute nonviolence (ahimsa) against all living beings. All practicing Jains try to remain vegetarians. The Jains celebrate the five major events in the life of Mahavira- conception, birth, renunciation, enlightenment, and final release after death. Major Jain pilgrimage destinations in India are Palitana, Ranakpur, Shravanbelagola, Dilwara Temple, Khandagiri Caves and Udayagiri Caves.